As soon as Deas and I pulled into the Two Medicine campground, we knew we were in a special place. 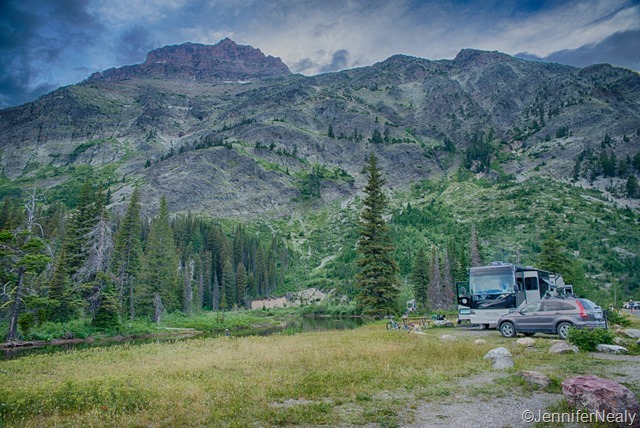 It’s simply the most beautiful campground we’ve ever been in. The campground is right on the lake with towering mountains beyond. 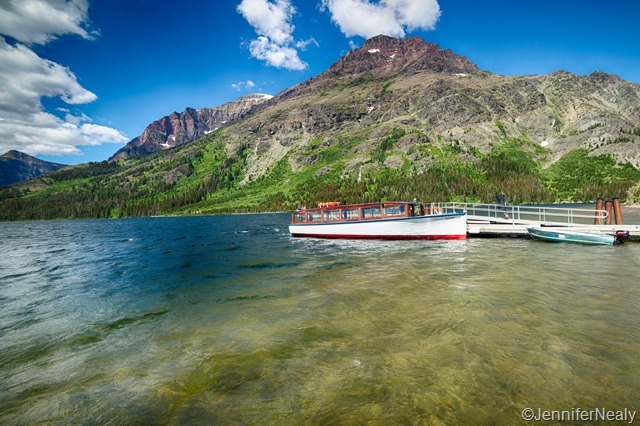 Just down from the campground, a short walk or bike ride away, is a boat launch that takes you to the other side of the lake, and there are several great hikes right in the area. When we were researching campgrounds, we never even considered this one because I hadn’t heard much about it, but we quickly decided to extend our stay from 2 nights to a week. There are probably only about 10-15 sites that will accommodate larger RVs here, but the turn over was pretty high so if you arrive early in the day, it should be pretty easy to get a spot. 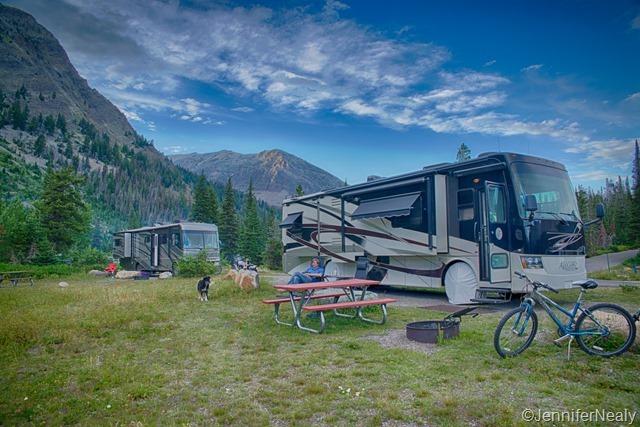 Also, Glacier provides some really useful information on their campgrounds – every day on their website they post what time the campgrounds fill, and you can also see the historical times that each campground filled on a daily basis going back a year. It’s very helpful for deciding what day of the week and/or time to arrive. After our initial two days, we noticed that one of the prime waterfront sites was opening up, so we made the easy decision to switch sites for the remainder of our stay. How we could we resist this view? I don’t generally write too much about our campsites, but I really can’t stop gushing about this one. We could walk right out to the lake, we saw a family of beavers swimming in the creek right behind us every night, and even saw a couple bears on this hillside behind us. If you don’t mind dry camping, this spot is perfection. But enough about the campsite! We also did some pretty great hiking while we were there. We took the south shore trail to Rockwell Falls, which is about 5 miles round trip. 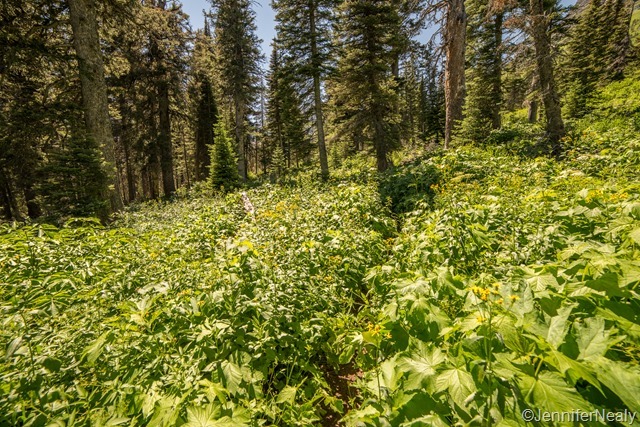 The trails starts off going through some wide open meadows with wildflowers, and then goes in the forest. At some points the foliage is so thick you can hardly even see the trail right in front of you. 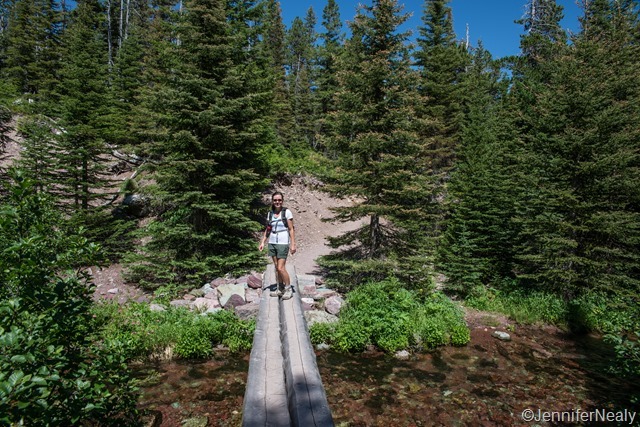 There were a couple of creek crossings with nice sturdy bridges, and one with a suspension bridge that swayed like crazy when you walked over it. Deas managed to wrestle the camera out of my hands for a few minutes and got a few shots of me. At the end of the hike, Rockwell Falls offered a lovely cool spot for us to stop and have lunch. On the return trip we saw a moose off in the distance eating out of a lake, but she was too far away to get a good picture. 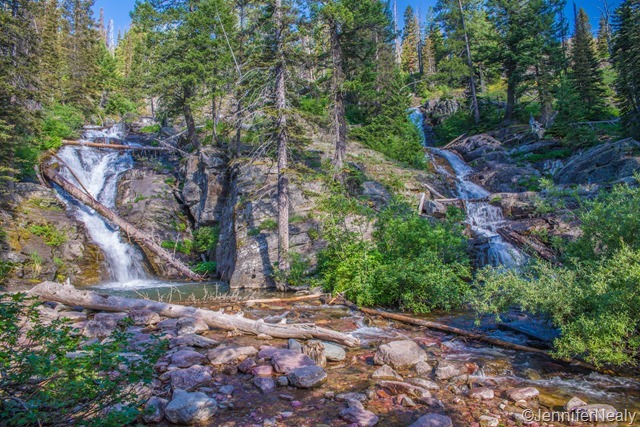 Near the end of the trail, we took a small side trail to see Aster Falls as well. A couple of days later we decided to do a hike on the other side of the lake, and took the 15 minute boat ride over to the other side. 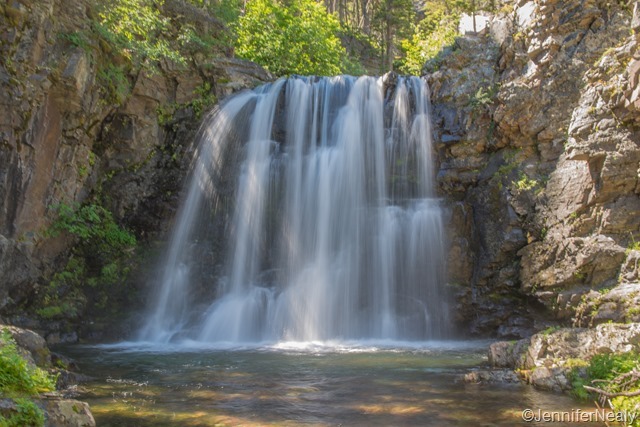 The destination for our hike was Upper Two Medicine Lake, and near the start of the trail is a short spur over to Twin Falls. 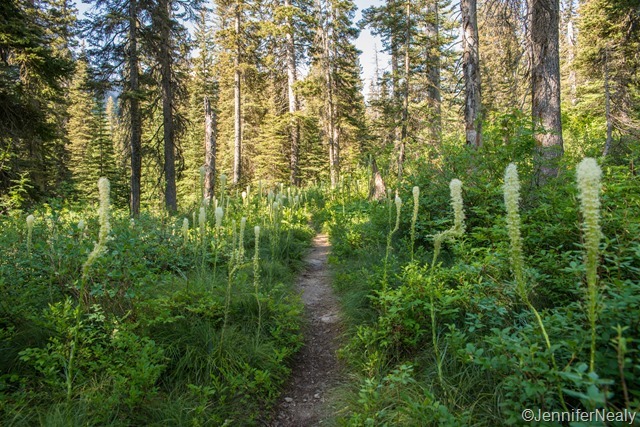 This trail was also about 5 miles, and had some beautiful meadow and mountain views and ended at the lake. Our last few days at the campground we made some more new friends – Kelly and Laura and their two dogs moved into the spot right behind us. We hit it off with them right away and during happy hour our first night together, Deas and Kelly made plans to do a long hike the next day. I had hit my bug threshold, and Laura had a hurt ankle, so we spent the day at the campground while the boys did a 16 mile hike. Laura and I considered maybe renting some kayaks, but the lure of a nice quiet RV all to myself was too much to resist. When you spend all day, every day with your spouse, it’s nice to have a day to yourself every now and then. So I had restful day of cleaning, getting some long-put-off chores done, and enjoying a great book. Deas and Kelly had a great hike and had a close encounter with some mountain goats, who passed right by them on the trail. 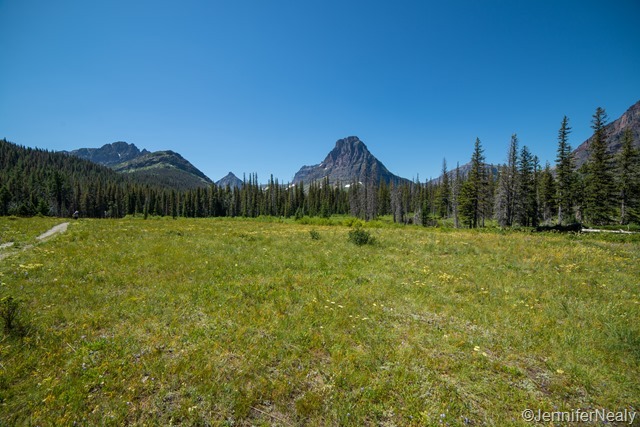 At the end of the week, Deas and I considered trying to get into the Many Glacier campground about 90 minutes north of Two Medicine, but the night before had a change of plans. It seems like we’re doing that a lot lately! At this point we’d been in Glacier for 3 weeks, and we were getting the itch to move on. 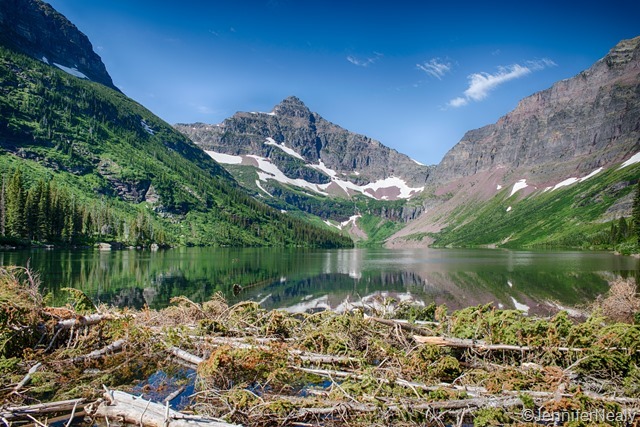 Many Glacier is beautiful and has some amazing hikes, but it’s so popular it fills up very early every day. So rather than risk not getting a site, we decided to save Many Glacier for our next Glacier visit (because we know we’ll be back), and we headed south instead. As usual, just gorgeous pictures. Campground looks great. Loved the waterfall. The flailing vid was so funny. Wish I could figure out how to load one to my blog. Glacier is certainly on our list. Maybe next year. Thank you! This is the first time I put a gif into the blog…it wasn’t too hard. The website I got it from provided the html code and I just copied and pasted into the post. Couldn’t believe I got it to work the very first time! We were fortunate enough to visit Two Medicine earlier this year…your photos took me right back, thank you! Indeed, a special place. Have you read Ivan Doig’s books set in that area? The books are as good as the area is spectacular. Your pictures are fantastic. I have not read those books, but I will certainly check them out now! Thanks for the recommendation! This place looks amazing! We may just have to dry camp for a few nights even though we don’t have solar. We are fine as long as we can run the generator in the morning and evening for a few hours. Did you hear generators or did people all have solar? What was the hike that Deas and Kelly did? I am not sure you could get into Many Glaciers. We have friends that camp there often and said there was no way we would fit and we are 40′. Did you have someone suggested a place you would fit? We don’t have solar either – we always get by fine with just our generator. You can run generators in any of the campgrounds from 8-10, 12-2, and 5-7 each day. There are some campsites in Two Medicine that are generator-free, but those aren’t sites you would fit into anyway. 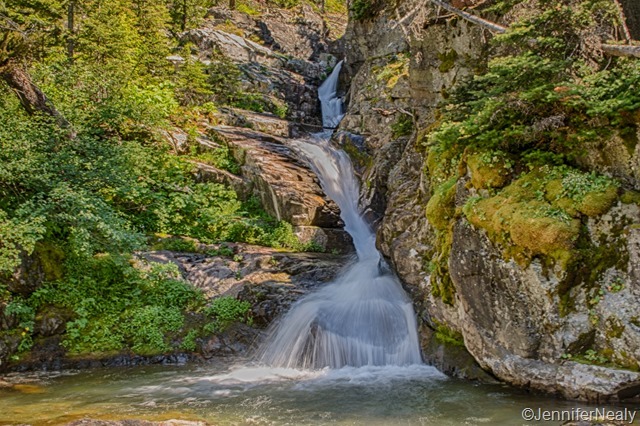 The hike that Deas and Kelly did was the Pitamaken Pass – they said it was great. As far as Many Glacier, we did a drive through one day, and there were several sites we could fit into (we are 35′ long.) Of course, there is no guarantee that those sites would be the ones coming open on the day we wanted to arrive. I’m not sure if 40′ would work or not, but I would check it out when you’re there – the hiking there is supposed to be fantastic. But the big sites in Two Glacier are really big – you’d have no problem getting in there as long as one of the big sites are open. Thanks! There’s been a little trial and error with the filter but I’m really enjoying playing around with it! Sounds like another “favorite place”! Your photos are gorgeous and make me want to go there! I seem to remember you and I doing the mosquito run somewhere but I can’t quite put my finger on it!!! Yes, Lisa I though about you! I think it was the Ouray Perimeter Trail where we had to outrun the bugs. I hate bugs! Was that Phoebe from Friends in the vid? Love it! Your pictures are beautiful. I can’t wait to visit Glacier someday. Yep, that’s Phoebe from Friends – that episode cracked me up and I always think about it when I’m running from bugs! 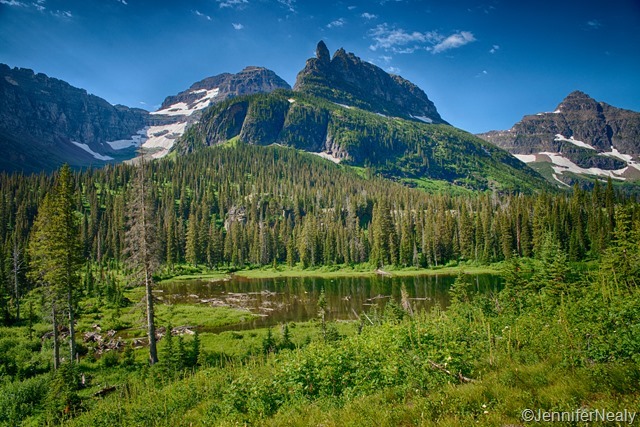 Glacier is beautiful – definitely put it on your list! Thank you so much! 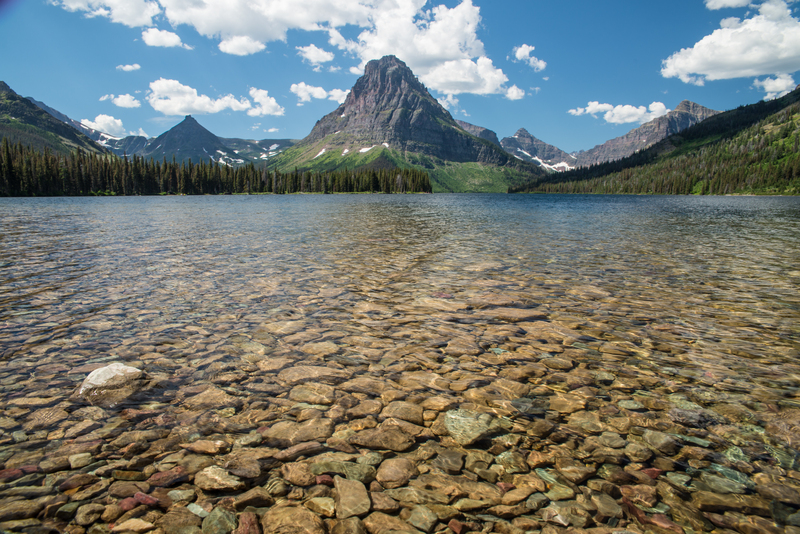 You’ll love Glacier. I think we’re planning on doing east coast next year, but if we go west again the following year, I’ll definitely want to revisit Glacier ourselves! Beautiful shots, what wide angle lens are you using? I think of that episode of Friends whenever I’m consciously trying to improve my form when I’m running. Thank you Pam! All of these photos were taken with my 24-70 lens. I have a full frame camera so that also helps me to get the wide shots. I also have a 14mm prime lens which I love and lets me get even wider shots. Wow!!! Look at that clear water — unbelievable! Hope to make it there soon and see the beauty for myself 😀 Glad to hear that you guys enjoyed it! Loved Two Medicine. Great post and photos. Makes me want to go back. 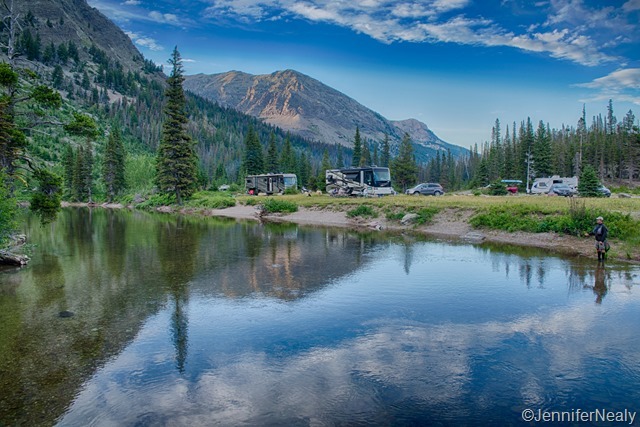 It really is a gorgeous campground isn’t it? One of our all-time favorites. We’re hoping to return in 2016. Hi Jennifer. Beautiful photos! In checking out the route, I see you have to drive under a railroad bridge in East Glacier. I read it has a limit of 13′, but your RV looks taller. Our fifth wheel is a few inches taller, tall enough to take off the satellite dish, so we’ll have to go to St. Mary Campground. Hi Renee – Our RV is 12′ 10″ – so we were just barely able to get under that bridge. I think there is another way you can go that avoids the bridge, but I don’t remember for sure. 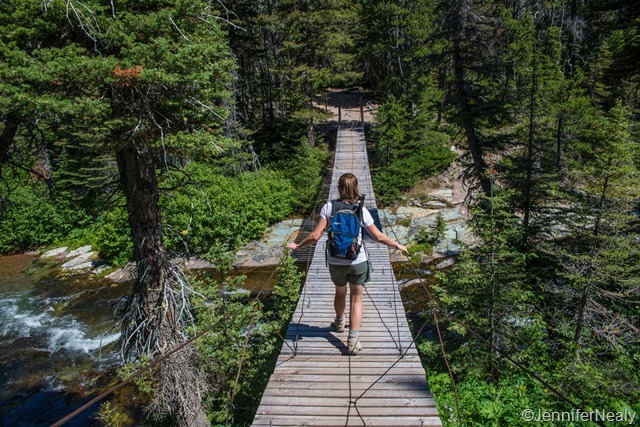 You should also look into the Many Glacier campground – there are lots of great hikes up there! Thank you! You’re right. In learning of the 13′ limit on the trestle, I started checking out St. Mary campground and saw that you can get to it by taking the same highway to Two Medicine, thus cutting off a lot of travel, or going around to 89 then back, which is what (sigh) we planned to do. I see now on the map that we could take the reverse route to Two Medicine by entering at Kiowa! Thank you so much. I don’t know why I didn’t think of that. Just a side note. My husband and I measured the height of our fifth wheel, but can’t remember. Before the trip, we’re going to measure again and write it down in a prominent place! I am relying on the measurement info that we got from the previous owners of our RV! I found a piece of paper where they wrote down the height….hopefully they measured it correctly! Hi Jennifer, I checked and entering Hwy 49 at Kiowa to take the reverse route to Two Medicine is not recommended for trailers of vehicles over 27′. I posted a question on RV.net and received quick feedback that it’s not recommended as it’s narrow and steep. Well, we have to remeasure or fifth wheel, so we’ll find out if we’ll fit under that bridge. Oh, now that you say that I do remember reading that too. We never drove that way so I can’t tell you what it’s like, unfortunately. We did see several large motorhomes and 5th wheels in Two Medicine, so I’m going to cross my fingers for you and hope that your 5th wheel is less than 13 feet! Thank you! Not only crossing my fingers for that but that the fires will clear enough for us to go. Jennifer -Today we finally hooked up our fifth wheel and measured the highest point – actually measured the two AC’s. Our Trav’ler satellite dish, when in travel mode, is two inches shorter than the highest point which is the front low profile AC at 12′ 9 and 3/4″ with the back AC at 12′ 5 and 1/2″. We’re good to go if the smoke clears enough to go to Glacier and Two Medicine.